You have heard it before, maybe read it sometime, or are thinking, “Could something I write have any effect on the web? There are so many talented writers/companies out there; I don’t see what I could add.” While it is true that there is a ton of content out there, consistency and edge are much less common. Although it seems like a valid excuse to either not try at all or for not reaching goals, it is actually a lack of confidence, definitiveness, and vision. Lots of people have written about the same things over and over, but if you come up with a new view, theory, or perspective, there is little to no-competition. As that theory/view grows into more and more acceptance, you are likely to be referenced many times in later articles. It can be as simple as your thought on a subject with your background and experiences in mind, not catering to the exact thought and mindset that everyone else is referencing. So not only are you providing unique content at that given time, but you will continue to build authority, inbound links, and mentions by having the most cutting-edge and original content for people to reference. Yes, it will take time to develop, but everything does. You can see that Lawn is actually bolded more often than Grass. While this is definitely a helpful result depending on my intent, it may not actually answer the question of my search intent very well. If need be, don’t write so often, but write more developed ideas when you do. Currently, we are seeing more diverse results for a generic query. For example, my search for ‘grass mowing’ can be seen above. Below is the SERP for ‘Lawn Mowing’. When comparing this to my search for ‘Grass Mowing’, at first glance it may seem as though the semantic qualities are simple and straight forward: Google has determined that ‘Grass Mowing’ is a search synonym for ‘Lawn Mowing’. While this is absolutely a valid assessment, a close look provides much more information into the developed semantic search results that we are seeing. Actually, Google has determined that a search for Grass Mowing, although nearly identical with Lawn Mowing, is not quite the same. Google has figured out that ‘Grass Mowing’ typically has “How to” intent and other do it yourself advice. Lawn Mowing is most often a search for a Lawn Mowing Company or service. While this is absolutely a valid assessment, a close look provides much more information into the developed semantic search results that we are seeing. 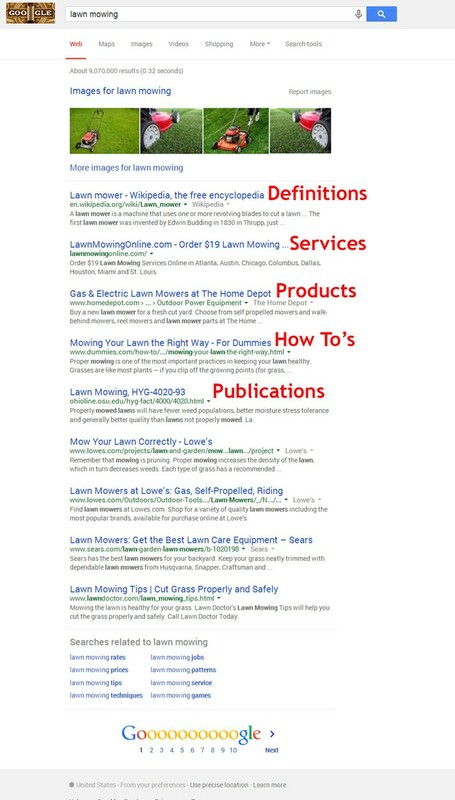 Consider the types of results that are shown on those same SERPs: Lawn Mowing Service, How to mow a lawn, definitions, products, publications, etc. I am quite sure that there are many more results out there that contain a greater number of exact match keywords and phrases, along with a higher number of repetitions in the body content than what Google has shown us as the search results. Regardless, Google has chosen to provide these results based on a number of factors (only some of which I can speculate outside of more common ranking factors). 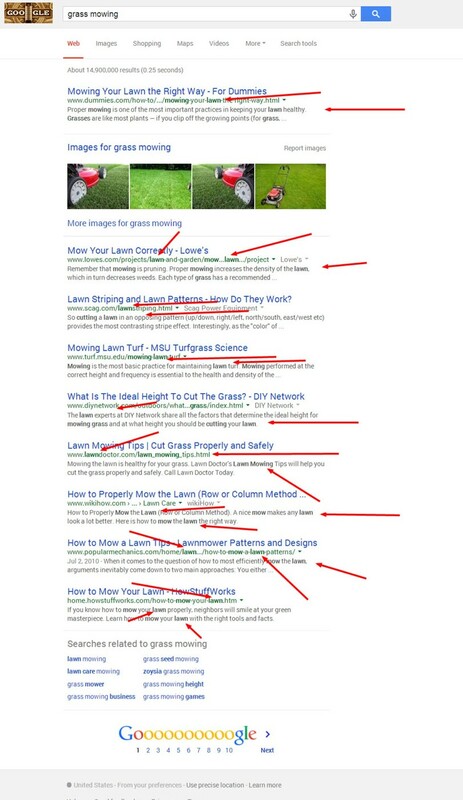 What this shows us is that Google is not absolutely sure what our intent was in our ‘Lawn Mowing’ search, so they are providing multiple types of results to have the best chance of meeting the need of our query. Long term, semantic search is going to gradually filter out any remaining major rank boosts some verticals still see from keyword density and exact match URLs, and other similar tactics. Will a time come when we ever stop worrying about keywords? No. That just wouldn’t make sense. Think about it, generally, a keyword is a noun that is categorizing a proper noun that you are thinking of or want to be connected to. If not a noun, it’s a question about a noun (e.g. Where can I buy pants? How to build a desk? What are GMOs?). You aren’t generally going to do a search for verbs, adjectives, or conjunctions by themselves. So there really is no way to get rid of keywords all together. With that said, we have already been seeing a huge shift from what keywords meant to us in SEO’s early days to the synonym equivalence version of keywords we see today. What does all of this mean for content? Well frankly, we need more of it, and it better be good. The only ways for search engines to know what you do and what you should rank for is from the words on your site, links pointing to it, and mentions throughout the web regarding your business. The more you put out there, worded in different ways, the better search engines can relate what you do to what someone is searching for because you are providing more context. While most of us may think exclusively about content when discussing semantic search, there are additional digital aspects that are affected. As we see semantic characteristics infiltrate the search engine algorithms more, we will likely see a change in how backlinks are evaluated and weighted. Currently, nearly every main digital marketing source will tell you that you should primarily aim for authoritative sites in your own vertical to link to your site and that backlinks from sources outside of your vertical are of little value at best and a negative factor at worst. This is not entirely true, especially as the algorithms mature. Think about it, if this were true: high quality directories, news sites linking to you organically, and client’s mentioning you on social media, blogs, and review sites would all be relatively meaningless. Semantic search already is factoring in “why” someone is linking to you. This concept is going to become gradually more and more integrated into the algorithms. If a client or customer is leaving good reviews, writing about you on their own website and linking to you, it tells the search engine that you are in fact a business and that you have customers. Isn’t it significantly easier to get peers (see: buddies) to put in a good word for you verses actual clients? In the same way, Google Now is able to understand you and your interests over time, so Google will continue to understand why websites are linking over time. Before Google had the artificial intelligence to understand intent, links from off-topic sites could be signs of obvious link manipulation. Now, Google can understand more complex associations and more accurately differentiate between a genuine endorsement and an attempt at trickery. So here we are, its 2015 and digital business is advancing. It’s time to stop trying to trick the world and the web into thinking your business is something different than what it is. It’s time to start truly building your business, brand, and customer base if you want to see results.